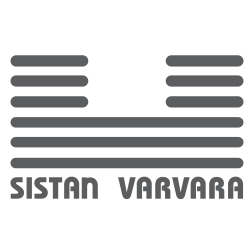 The concept of Sistan Varvara brand is based on finding the harmony of the rhythm of lines and shapes and their movement in space. One of the brand codes is the lack of black as a unified and artificial. It is a desire to create unique exquisite products. Each Sistan Varvara collection consists of several divisions that represent a certain concept and are subject to a general idea. "Exemplaire" - products made from non-standard materials in one copy. Like refined varieties of wine, the products of this line are numbered and packed in wooden boxes. "8" - products made of eight segments or through the use of eight constructive lines. "Unite" - products created with one constructive line or one segment of matter. The brand produces men's and women's lines.